“I don’t like to cycle or travel,” says the new born explorer who has cycled from Kashmir to Kanyakumari. They say, “follow your passion and you’ll get success.” But this young boy of 22 years of age has made efforts to prove something contradictory!! He has searched for success and hugged it while doing something he hates. Here we get to understand what can be the driving force for anyone to be successful once taken an aim and how can dedication be increased throughout the steps towards success. 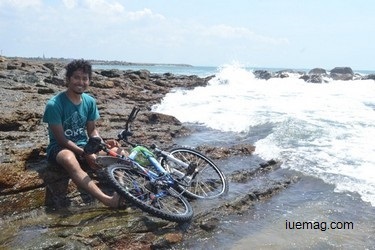 At a point in life we want our environment and things around to change, but this boy wanted to see himself change and his belief that a cycle ride from Kashmir to KanyaKumari will surely change his perspectives got him the adrenalin kick and he set off his journey from the North point to the South point of India. Taking up this challenge was an idea that struck him in 2013. Along with his studies and failed attempt to persuade parents supported by favourable climatic conditions he took up his experimental ride by leaving Delhi on 14th Feb and reaching Kashmir on 16th Feb. He started cycling from Srinagar on 17th Feb 2015 and reached Kanyakumari on April 3rd at 10:30 am. Having graduated with Psychology honours in December 2014 he was determined about his next step in life. Completing the initial 50 kms was something that made him realise the world around and how one can take motivation from each and everything around. While still in Kashmir there came a day when it was raining heavily and he couldn’t ride but aimed to ride the next day in a hope that the rain would stop. The next day too, rain did not stop and he was stuck. “I thought I just can’t stay in here. If I did I will be stuck forever and I just came out with my baggage and bicycle and started again,” he says. Then there came a point where he was half wet and half dry which irritated him the most and wasn’t able to concentrate on his goal. The very next moment he took off his jacket and lying down on a bench he simply let the rain drench his body and he could feel the drops on his face. “I then felt that I had done a mistake by this act and the next step I should take has to be to put my bicycle in front of a truck and declare that I had met with an accident, get back home and convince people saying that I will try this next time,” he says laughing. Having lost the strength and courage to get back on wheels, there was something very strong that struck him and this experience in Kashmir accompanied him till he reached KanyaKumari. He acknowledged that petrol pumps have some machines that could blow dry air or heat. Fully drenched in water he went there and informed a person about his trail from Kashmir to Kanyakumari and they gave him all the possible help along with offering walnuts, tea and warm clothes too. “One of the guys even said that he has relatives in Bangalore and when I reached there I could easily get an accommodation. This really struck my heart to see how compassionate people could actually be and try to make one’s dreams happen with all their efforts and this gave me the strength to never stop ever again,” he narrates and is again filled with gratitude in his heart for those people working at the petrol pump. The ride with Bawri- his bicycle was an amazing one throughout Kashmir, Jammu, Punjab, Haryana, Delhi, Uttar Pradesh, Rajasthan, Madhya Pradesh, Nagpur, Maharashtra, Telangana, Andra Pradesh, Bangalore, Salem, Madurai, Dindigal and finally Kanyakumari. While on this trail he took many lessons which he would never term as “Challenges” and he shares them with a smiling face. These lessons which according to his belief were meant to change him, today, he witnesses the changes like patience, tolerance and sacrifice with satisfaction. “While on such a journey, we might not get food or water or accommodation on our routine like in home which again teaches us to come out of comfort zone and survive in another zone,” he confides. Without any prior training he just took off with this adventure trails and has come out happily with many funny moments lived! One of these he shares, “On exiting Hyderabad, those who were following me from the GPS I had stated on Facebook and tracking me up met me on the highway. Followed by a brief intro we all had lunch together and on departing they gifted me a toy gun. To my surprise, I asked them as to why they were offering such a gift and found that it was their concern for my safety as now I was to ride into parts that might have me encounter some threats or robbers due to my appearance as a tourist. There, I also felt that I actually might need that gun as I didn't possess a well-built body. After three days, while at Kurnool, I stayed besides the bus stand. Kurnool had witnessed a bomb blast last year due to which the security concern was high in that area. There came a police man and checked my belongings and found that gun!” he laughs and narrates further, “He was shocked and enquired about the gun to which I replied that it was for safety purpose. He did not believe that and again with a failed attempt I told him about my travel which he did not believe either. Then, I happened to guess that he was trying to pull out some money from me but I tried to attempt once more before giving up and showed him the pictures as a proof. And this time, I had finally passed and he spared me from all the bitterness,” he laughs again recalling those instances. Bawri who is now Gaurav’s best friend would also fail sometimes to favour Gaurav on his trail when at Kashmir, the terrain was extremely uphill as well as at Madhya Pradesh when the weather was windy for 3 days making it difficult for Gaurav to paddle. Above all, this was a successful trail where Gaurav accomplished to bicycle from Kashmir to Kanyakumari and explored the best lessons of life which he shares with us, “Until you lose it in your mind, the body just keeps following. Set it up straight in your head and body shall never dare to interrupt."